 Beer History. Brewing History. Brewery History. It's all here! Surf our site and learn about the rich history of beer, brewing and breweries in America. Cheers! 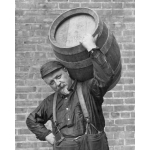 In the year 1900, there were about 2,000 independant brewing companies making beer in America. Of those, fewer than twenty remain in business today. What happened to all of America's breweries? Find out at The Beer Library. In 1911, John P. Arnold set out to fill a void that existed in brewing literature. The result was Origin and History of Beer and Brewing  a global study of beer throughout history. Up to that point, there had been no such comprehensive study of beermaking. Arnold, a writer and historian, was particularly well-suited to tackle the collossal job of assembling a world history of brewing. He was a long-time writer/editor for the Chicago-based brewing journals Der Braumeister and Siebel Technical Review. In recognition of Arnold's contribution to the study of brewing history, BeerBooks.com has reprinted this groundbreaking book from an original 1911 edition. » Read more at BeerBooks.com.